I have been living in Myanmar now for the best part of nine months in my role as Chief Executive Officer of Digital Money Myanmar. Digital Money Myanmar is a joint venture that has been established by Telenor, one of the world’s largest mobile operators with 189 million mobile subscribers, and Yoma Bank, a financial institution that has been in operation in Myanmar for over twenty years. We believe that the partnership between these two organizations provides the right model for Myanmar, with the joint venture leveraging the distribution of Telenor, and the local expertise and cash management capabilities of Yoma Bank. financial service providers to greatly expand their reach in Myanmar. Technology, and particularly mobile telephony coupled with agent cash in and cash out services, will provide a significant accelerator to this development. Mobile operators, partnering with banks, are best placed to expand the reach of financial services in Myanmar to those that are unbanked today, leveraging the significant distribution networks that are already in place. Banks and microfinance institutions must also play a critical role, and through partnership with businesses like Digital Money Myanmar they can develop innovative credit and savings products that will reduce transaction costs, and enable the financially excluded access to a broader range of products. Banks in markets such as Kenya are now seeing significant deposit mobilization through partnership, not competition with mobile operators. 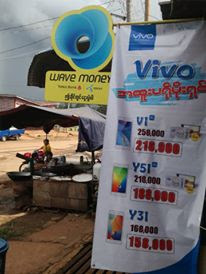 Partnership is the future of mobile money in Myanmar. The ability to pay wages, pensions and conditional cash transfers efficiently and transparently. Research in other markets indicates that when electronic channels are used for these payments there are considerable improvements in transparency and a reduction in leakage, with the potential for 100% of the benefit reaching the recipient every time. Financial inclusion helps individuals impacted by poverty manage the challenge of irregular income and occasional large bills. It can also help to pull them out of poverty through improved education and health care. The ability for the Myanmar diaspora in neighboring countries to easily transfer funds to family through mobile based international remittance will formalize the way these funds enter the country, and lower the cost of transfer. For micro and small business, financial inclusion can provide capital for establishing and expanding trade. Removing traditional barriers through leveraging technology can improve access to credit, boosting economic growth. Financial inclusion draws more businesses into the formal sector, broadening the tax base for government which can increase funding for improvements to social services. Research has estimated that financial inclusion driven by mobile financial services in developing markets may increase gross domestic product by up to five percent within five to seven years. This GDP growth is stimulated by increased employment as a result of the development of mobile financial services, improved access to credit prompting the development of new business, and the benefits of formal remittances and increased savings. As Myanmar continues its transition, it is critical that financial inclusion remains a priority and that industry wide collaboration occurs to develop business models that will be sustainable and beneficial to the financially excluded. The government is playing an important role in ensuring that the right regulatory model is put in place to allow for mobile operators and subsidiaries to provide these services. Myanmar was recently reported to be the third fastest growing mobile market in the world, after India and China. There is a similar opportunity for Myanmar to be celebrated as a global leader in the acceleration of financial inclusion, and we are excited about the opportunity to contribute to that vision. Brad Jones is the CEO of Digital Money Myanmar. He has previously worked at Visa on their emerging markets mobile strategy in Asia Pacific and was the founding Managing Director of WING Cambodia, the first bank-led mobile money operation in South East Asia. Follow Brad on Twitter @bradjoz.